Puppets crocheted by third graders at the Chicago Waldorf School. Gil Ron and Eve Thiry play scissors, paper, rock as part of their morning work at the Chicago Waldorf School. The school believes movement—including singing and dance—help children learn vocabulary and the rhythm of language. In a sunny classroom, first graders at the Chicago Waldorf School are not picking up books. Instead, in every student’s hands are two wooden knitting needles. Seven-year-old Henry Gordon is carefully wrapping the yarn around one needle, then pulling his stitch through with the other hand. Most schools in the United States begin teaching students to read from the time they enter kindergarten. It’s not hard to find 4-year-olds learning the letters of the alphabet and even reading easy words in preschool. But the Chicago Waldorf School wants to work full-time on developing kids’ imagination—through knitting, stories, and play—before turning to phonics. 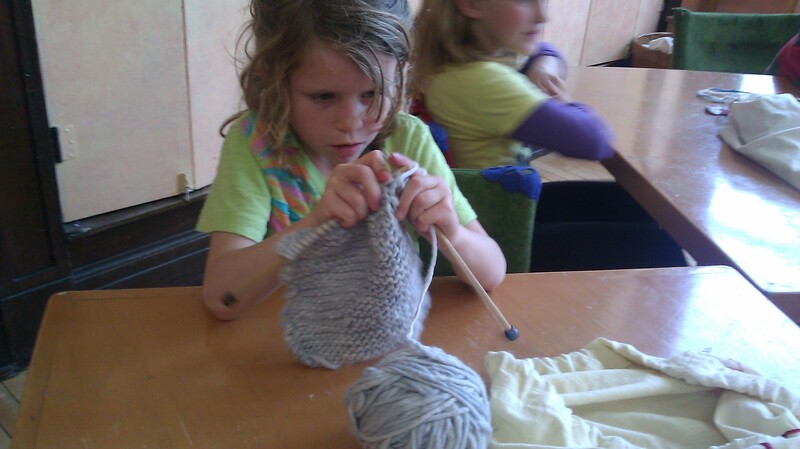 Teachers say knitting teaches skills children need to be good readers. The process of knitting is like threading a story. Kids are learning focus and concentration. They’re gaining fine-motor skills, needed for writing. They’re seeing patterns. They’re moving from left to right, the same way you read. They’re gaining confidence. Teacher Claude Driscoll says the goal of the little rhyme is to create a picture in kids’ minds of what is happening as they form each stitch. And, she says, creating a mental picture is a skill used all the time in reading. To help kids create “inner pictures,” Waldorf takes a radical approach: there are no books in the first grade. There are not even picture books, because teachers want students to come up with their own ideas of what things look like. In schools nearby, first graders are reading 100-page chapter books already. At this private school where tuition is upwards of $15,000, parents and teachers are content to let the school focus on cultivating students’ sense of story. “We’re reading ‘cat’ and ‘bat’ and ‘sat’—all those three-lettered words,” says Julia. Maybe kids read books on their own? “No. We don’t,” Julia says. “We’re not professional yet—we’re just learning,” she explains. But while there are no books in the first grade, there are lots and lots of stories. dy and some bothersome goblins. Afterward, students drew a picture of the story. In clumsy capital letters, they copied a sentence about the story their teacher had written on the chalkboard. The goal is to get kids to hear stories, internalize them—and polish students’ understanding of plot, conflict, and character. Essentially, the school is focusing on comprehension before turning to phonics. Waldorf also puts a big emphasis on movement and song. With their desks pushed to the sides of the room, the first graders dance and sing every morning. They recite poetry—including Tennyson the day I visit. It’s poetry they’ve only heard, never read. Waldorf teachers say all this helps develop vocabulary and a sense of rhythm in language. Waldorf teachers say when students finally do sit down to learn the mechanics of reading in second grade, most will pick it up at lightning speed. Early childhood education expert Barbara Bowman says there are whole countries that share Waldorf’s philosophy of teaching students to read late. In Sweden and Japan, kids learn to read when they’re 7 or 8. Even though Waldorf parents know their kids won’t be picking up books right away, it can be nerve-wracking for some. Brian Chambers has three kids at Waldorf, and his wife teaches in the preschool. Even with that, he did worry at one point. Chambers says at age 11, his daughter now reads constantly. But he does see issues. His second child has dyslexia. That went undiagnosed about two years longer than it might have in a school that starts kids reading earlier. Seventh graders at Waldorf are putting on Dante’s Inferno this month. Their teacher, Carol Triggiano, says no one would know these kids were not reading until age 8 or 9. Triggiano says all the things her students learned by knitting and singing and hearing stories are still with them, helping them read.